MakBit Virtual CD/DVD emulates up to 20 CD/DVD-ROM drives and virtual hard disks. MakBit Virtual CD/DVD supports all popular image file formats - ISO, UDF, IMG, NRG, MDF, VCD, BIN, VHD. MakBit Virtual CD/DVD has speed control, cloning and ripping features. MakBit Virtual CD/DVD supports all popular image file formats - ISO, UDF, IMG, NRG, MDF, VCD, BIN, Virtual PC VHD, etc. It is compatible with Microsoft Virtual PC hard disks images. 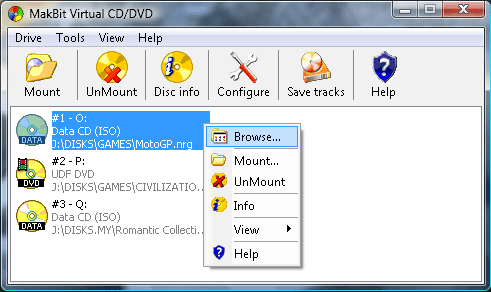 Virtual CD/DVD-ROM and HDD emulator with speed control and ripping features. * Compatible with Microsoft Windows 2000, XP, 2003, VISTA. Qweas is providing links to MakBit Virtual CD/DVD 1.95 as a courtesy, and makes no representations regarding MakBit Virtual CD/DVD or any other applications or any information related thereto. Any questions, complaints or claims regarding this application MakBit Virtual CD/DVD 1.95 must be directed to the appropriate software vendor. You may click the publisher link of MakBit Virtual CD/DVD on the top of this page to get more details about the vendor.